While many customers acknowledge that Starbucks coffee prices are excessive, few stop to think what that pricing does to their finances and their general way of thinking about financial decisions. The rapid growth of the Starbucks brand in many ways resembles that of Walmart. Both have risen to extreme popularity in the last 20 years. Like a virus, they both keep spreading. As they spread, many small local companies are left in their wake, being forced to close shop. Those local companies simply cannot compete with the huge budgets and anti-competitive nature of the big brands. The key difference between the two is that Walmart actually helps consumers save money. By using their massive buying power, they undercut all competitor pricing. On the flipside, Starbucks uses their big budget to create a ‘superior’ product and then gouge their customers at the cash register. That higher price actually helps convince people that the product is better. Their product just happens to be based on a drug that is quite addictive. Doctors may argue that it is actually caffeine dependence and not true addiction, but that is just a difference in wording. You develop daily cravings and suffer from withdrawal symptoms if you miss a dose. In my eyes, that’s an addiction. Basically Starbucks is a high-end drug dealer with some of the best drugs on the market. Similar to a drug dealer, they muscle in on the most lucrative turf and open up locations where they can push the most product. They even sacrifice initial profits to take out competitors, the same way a drug dealer might lose some associates in gang warfare when trying to take over drug dealing turf. Not only do they become the most convenient coffee shop to go to, but they also get to imprint their brand in your mind each time you pass by. You are constantly reminded to get your coffee fix and what better place than the guys with the good stuff? All the people walking around with branded coffee cups help a lot too, especially when it is your peers enjoying that coffee in front of you. Ironically, or more likely purposely, their logo is quite hypnotic with its wavy lines drawing your eye to its center and holding your focus upon a beautiful woman. I wonder how much market research they paid for to determine which logo aspects can hold your attention the most and create a feeling of inner peace. Illegal drug dealers must be pretty envious of the slick marketing revolving around addiction. So they’ve got the great addictive product and the best marketing money can buy, but does it actually affect how we think? I sure think so. What do you think happens when you mindlessly get your daily coffee dose with the knowledge that it is expensive? That addiction, craving or whatever you want to call it leads to self justification for spending that much. Done on a daily basis, it is essentially self hypnosis. Now what do you think happens when a Starbucks addict is then presented with another spending decision elsewhere that may be considered a luxury or excessive expense? For many of those people, their Starbucks over-spending mentality is triggered and they automatically do the whole self justification routine. They tell themselves that they might as well pay for quality or that it can be their way of treating themselves. After daily mind training, such thinking just comes naturally. The amount wasted daily by overspending coffee can be calculated easily with this helpful calculator. That calculator even factors in the interest percentage you could’ve earned from that wasted money. The actual difference may not be huge, but imagine you were not spending any of that money. It is when you develop the Starbucks spending mentality that you seriously start hurting your personal finances. Then you are overspending all over the place without even realizing it. It doesn’t take a rocket scientist to realize that you could be wasting an incredible amount of money if you are paying higher prices for many everyday expenses. Unfortunately when you get into the overspending mindset, this is not easy to accept and part of your brain tells you that it is fine and dandy. Now consider what this does on a larger scale with all the people who frequently indulge on Starbucks coffee. This is when you really do need a rocket scientist to compute the insane amount of wasted money this leads to. We evolve from just a consumer society who needs to buy stuff into an excessive, overspending consumer society. It is turning into a society that not only wants things, but one that also feels that we are all entitled to the very best. Consumers are better off trying their hand at making their coffee with one of those pod coffee makers. So before heading to Starbucks later today or tomorrow, take some time to calculate how much you are choosing to spend each month or year. Think about what you could be spending that money on instead. Think about how the aggressive marketing may be suckering you in. Luckily caffeine dependence is a lot easier to overcome than something like heroine or crystal meth. Those illegal drugs just aren’t pounded into your brain throughout the day by society. So it will take willpower. You just have to learn to be proud of saving that buck or two each day (or more if you quit coffee completely). Tell yourself that getting off the Starbucks bandwagon is an accomplishment and find some way to reward yourself. Just don’t reward yourself with the very thing you are trying to avoid. Learn more about the latte factor. Do you have a Starbucks addiction? How much do you estimate you spend on it daily? Thankfully I don’t have a Starbucks addiction! Me too! I’m glad I never started drinking coffee. Once in a while I’ll tag along and get something chocolately, but it’s definitely not a daily fix. My husband used starbucks as his mobile office (sales) because he needs somewhere that has free wifi. Then he realized he saved $0.03 by going to barnes and noble and using our membership discount on his coffee. Then we realized that if he sat in mall seating around the Starbucks, I could brew him coffee and he could drink it from a thermos and still use starbucks wifi. Anyway, we met at a Starbucks, so that place does hold fuzzy feelings in our hearts. It is amazing how many people do their computer work in a coffee shop. Personally I would never be able to properly concentrate with all the noise and people coming and going. I think a lot of those people are just looking for an excuse to have starbucks all day long. I am very thankful that I never had a coffee addiction, but I had something even worse — a diet soda addiction. After figuring out how much it was costing me — I gave it up cold turkey! Was chugging about $5 a day! New to your site by the way, going to check out the older posts. Keep it up. Thanks for bringing up your other addiction. Most addictions have a serious impact on our finances. I am happy just drinking water throughout the day. It is refreshing and doesn’t cost me anything. I’m a big coffee snob but I’m cheaper than I am a coffee snob, so I don’t spend big on brew. Thankfully, we have great coffee in the office, so I’m ont lacking for the good stuff. Yep you can’t complain when someone else is paying. Even if you were paying though, once or twice is not too bad. It’s when it is a daily obsession that the money adds up big time. I am a coffee addict, but not Starbucks. We have them here in Bangkok and they are actually cheaper than back in the States (go figure). But even at $2.00 for a grande latte I can do way better getting my daily coffee fix from one of the local coffee carts at $0.65 per cup. It’s icy, sweet, caffeinated heaven! In some areas Starbucks just can’t compete with the local offerings. It was the same way over in Australia. There were so many good coffee shops that there were far less Starbucks locations than in North America. The key word for me is ‘choosing.’ I know SB is more expensive than some other place but you know what? It’s honestly a lot better than most places too, both in quality and in service. I choose to spend the extra to get something that I enjoy. And know what? I’d gladly spend more at a local coffee shop if they had better coffee! In fact I don’t even buy SB by the pound, choosing instead to buy our new favorite Peets or some local roast at Whole Foods. As for local shops being hurt by SB, I’ve heard there’s actually an opposite effect – there are specialty shops that are doing well, opening up near SB locations. Seems those who really want high-end coffee are willing to go to the local shops over SB. Now here’s my new favorite way to deal with successful companies and their prices – invest in them! Good to hear from the other side of the fence. People are definitely free to make their own choices. When managing your finances it is important to determine your own priorities. What is a waste to one person might be money well spent to another. You just have to figure out if it is a luxury that fits into your budget. As for the competition factor, that probably depends on the area and the actual quality of the competitors’ coffee. In some areas they go overboard with the number of locations or make a point of getting the very best locations. So it is more likely the smaller coffee shops that would suffer more. And yes Starbucks would be a great investment. Despite not being a Starbucks fan, I do admire their marketing strategy. I’m not really a coffee aficionado. I’ll drink marine coffee with a smile on my face. Aside from the outrageous prices, I don’t really have a problem with Starbucks. They don’t seem to be driving out competition where I live. Including setups in grocery stores, I know of about a dozen Starbucks and probably 2 or 3 dozen cafes. I’m assuming this is another case where the cafes have good enough coffee and service to compete. In some areas customers seem to prefer a laid back coffee shop instead of supporting a big corporation. I guess it is a unique situation in every city. Starbucks tend to be quieter than the other places. No coffee addiction here, but I have to admit I have had a bit of a jamba juice obsession lately. Fortunately, they make frozen smoothies you can buy at the grocery store and mix at home in the blender. A savings of about $3.00 per smoothie vs. buying them at the store front. At least that is a healthy obsession and one that is not truly addictive. I like a good fruit smoothie once in a while, but the pricing for some of them is pretty crazy too. Whenever I hear somebody talk about jamba Juice, I think about the movie Baby Mama. “Corporate juice pimps.” Personally, I like Inta Juice. I see smoothies in a similar light as I do cocktails. To make what I want, I’m going to need to spend a bunch to get the right ingredients and equipment. But I just don’t consume enough to be worth it. Yes there are certain things that are just not financially feasible to make at home unless you consume enough of it. I’m actually not a Sbucks person – I prefer Tim Hortons, but private coffee shops are even better. But I brew my coffee at home so my coffee/pastry spending is low. Tim Hortons is a much more affordable option, but there aren’t many locations outside of Canada yet. My wife and I have recently made an executive decision to buy an espresso maker with a milk steamer, then buy starbucks coffee to make our own. It saves a small fortune and is perfect for taking in a flask to work! The habit is as expensive as smoking! That is a good option to save for people who do insist on Starbucks coffee. The coffee would be cheaper and you wouldn’t be tempted by the impulse items and baked goods. I don’t spend at Starbucks for one reason: I don’t care for their coffee. It is bitter and burnt tasting to me. I prefer to make my own Dunkin Donuts coffee at home. Consider yourself lucky John. I’m not actually a coffee drinker myself, which I guess makes this post a bit ironic. All coffee tastes bitter and burnt tasting to me. It seems that a lot of people do prefer SB coffee though. I don’t get why coffee is picked on so relentlessly. 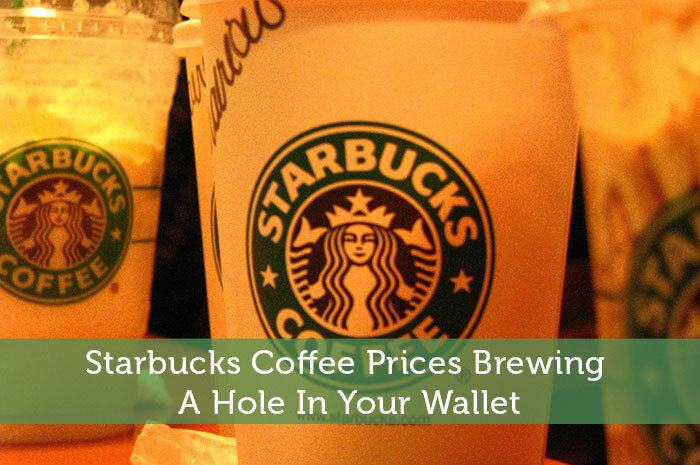 A normal cup of coffee even at starbucks barely costs $2 depending on the size. Maybe if you are buying Venti Mocha Fraps all the time for $5.50 it starts to add up but $2 for something you might enjoy for an hour is hardly a bad deal. It pales in comparison to buying clothes, shoes, and video games. Worry about the dollars and not the cents. The problem is that the caffeine is addictive. So that small purchases turns into a daily need. If you’re well off financially, you can probably still fit it into your budget without a problem. On the other hand, if money is tight or you are in debt, that extra $500-1000+ per year could be put to better financial use. Or take it a step further and consider how much it costs over 10-20 years. It’s a cost/benefit analysis. That $500 isn’t wasted if the person enjoyed the drinks and their time spent in the shop. You might think it’s wasted money but others wouldn’t. Some people might say that blogging and commenting on blogs is a waste of time and effort but we might not think so. Also, your same logic could be used to pick on any purchase that wasn’t involved in providing the bare necessities of life. Good point about perspective. We do all need to figure out what expenses are truly important to us. A crack addict could also justify that they enjoy their habit, making it a worthwhile expense. So while we do all have our own financial priorities and enjoyments, simply enjoying the purchase does not necessarily mean it is a good thing to include in your budget. I learned years ago that if something has a clever, fancy name, it’s going to cost you. At Starbucks, you can order a slew of fancy-name drinks, in fancy-name cups sizes, from someone called a coffeeneesta or something. That’s fancy cubed. If you have a Starbucks habit, consider yourself lucky. That’s a nice IRA account just waiting for a little self discipline. Great point about the fancy names. They are just trying to make their product seem fancier than it is by tacking on some long names. They want you to be able to justify overpaying.